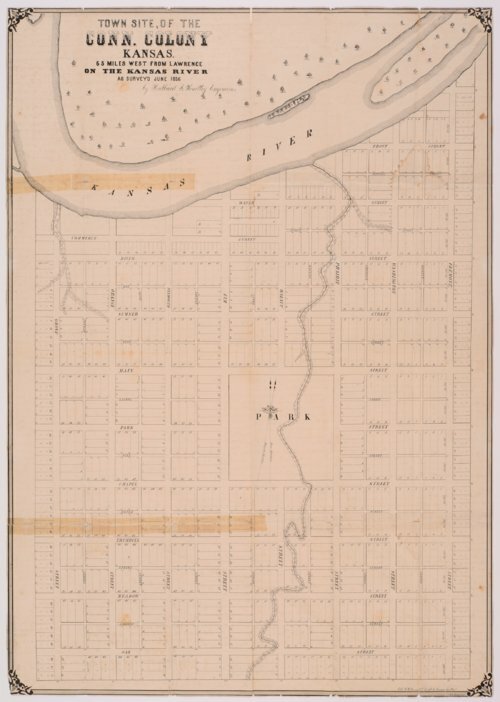 A map showing the town site of the Connecticut Kansas Colony, 65 miles west from Lawrence on the Kansas River. A letter written by Charles B. Lines covers the back of the map. In 1856, after Kansas became a territory, Lines was one of the men who joined the Connecticut Kansas Colony, also known as the Beecher Bible and Rifle Company, a group of individuals who wanted Kansas to become a free state of the Union. The colony located in Wabaunsee, Wabaunsee County, Kansas. Lines spent the rest of his life in Kansas with his family and died at the age of 82 on March 31, 1889. Collections - Manuscript - Lines, Charles B.